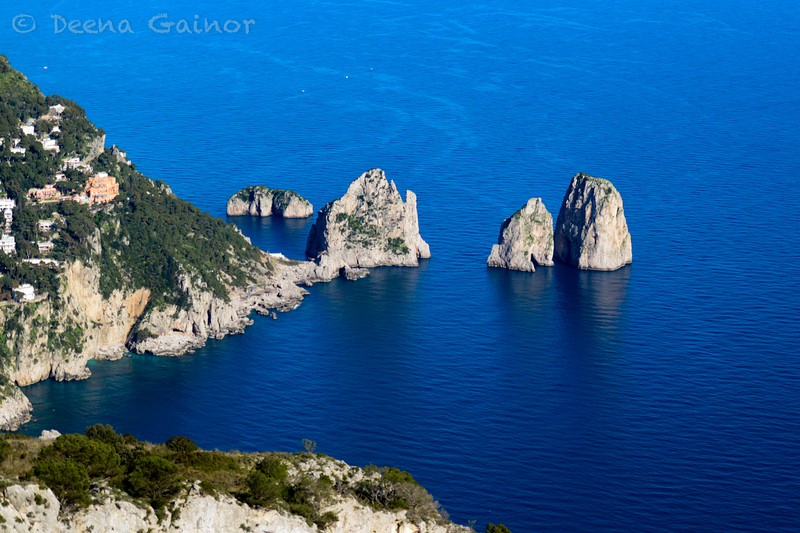 The “Amalfi Coast” and “Capri”. I’m curious to know what images and thoughts are conjured up when you hear these words. Please take a moment to share that with me. My relationship with Italy grew when I first set eyes on the Amalfi Coast. The stunning beauty of the coastline, the azure blue water, the houses clinging to the edge of the cliffs, took my breath away. Try as I might, I could not capture the beauty in a photo. The love deepened when I met Capri, a picturesque island off the coast of Southern Italy. Here it was not only the unbelievable seascapes, but the charm and love of the people of Capri that captured my heart. I have longed to return with my husband and children for many years and we were finally able to do that this year. The above photo captures the gorgeous Faraglioni off the coast of Capri. In order to get this view, you can either hike or take a stunning, 12-minute ride on the chairlift to Monte Solaro. We rode up and hiked down. I can safely say this was one of the best hikes I have ever experienced, with scenic sea views and rugged cliff sightings around every turn. The panoramic views from Monte Solaro, the highest point of the island, are stunning. Enjoying the breathtaking beauty with friends made the experience much more meaningful. From the summit, you can see not only the Faraglioni but the Bay of Naples, the Amalfi Coast, and some nearby islands like Ischia. You may even catch a glimpse of the famed Vesuvius. Here are a few shots around the island with our dear friends, who I met over twenty years ago. They are both now married with children. We enjoyed many special times together over home cooked meals, delicious baked chocolate cakes, and Italian cookies. The warmth of friendship was a blessing and we hope to meet them again some day. Grazie mille, Lauro and Antonietta, for your warm hospitality, friendship, and meals, and Angela for the wonderful dinner and dessert! It was so amazing to see you all again. 1. 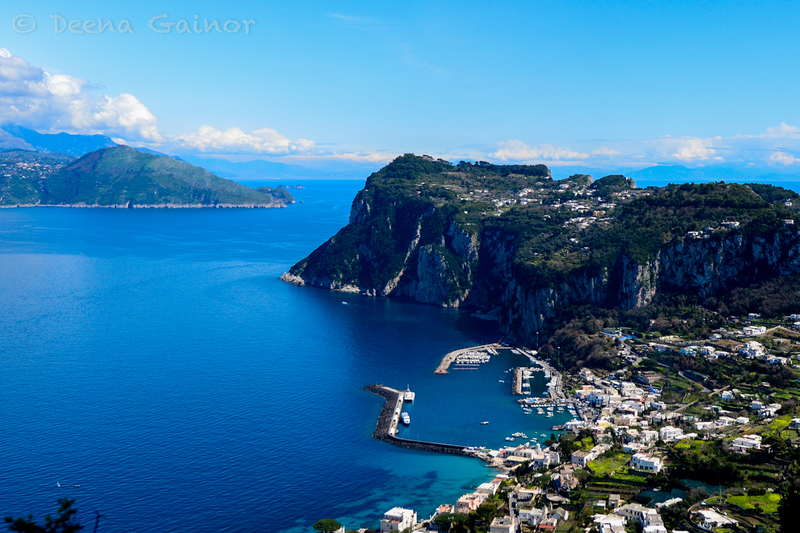 Getting to Capri is an easy ferry ride from either Naples or Sorrento. 2. If you’re coming from Rome, make sure to stop and visit Pompeii along the way. It’s a fantastic destination rich in history and can be toured within two hours. 3. If you have the time, spend a few days on the Amalfi Coast, visiting the unique towns dotting the rugged coastline. 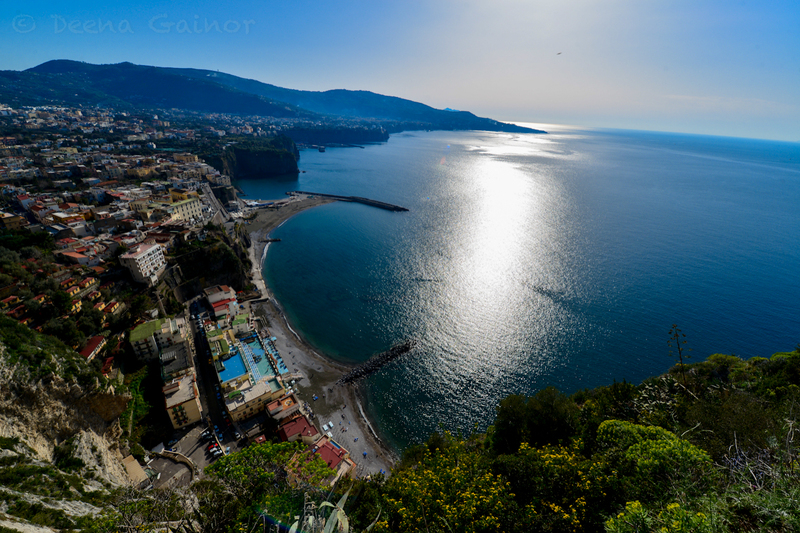 Sorrento is one of my favorites, and you can easily spend the day there before taking the last ferry to Capri. 4. If you want to visit Monte Solaro, catch a bus up to Anacapri, where you can either ride the chairlift or hike up. But definitely take the time to hike down! 5. If you’re visiting in warmer weather, make sure to take a boat around the island and visit the Blue Grotto! 6. Take time to enjoy a gelato but remember, if you sit, you pay. 7. Stop and meet the locals! They are beautiful. Loved this post, and the pictures you’ve captured are absolutely stunning! Hope you don’t mind me asking what camera you use? The quality is truly exceptional! Thanks so much. I used a Nikon 610 for most of these. I love this camera. Didn’t know you had a history in Italy. Love to hear that story. What do I think of….romance! Yes, definitely a history. One of my best friends and I backpacked through Europe one summer and discovered Capri. I’ll tell you the rest next time I see you, but I LOVE Italy.